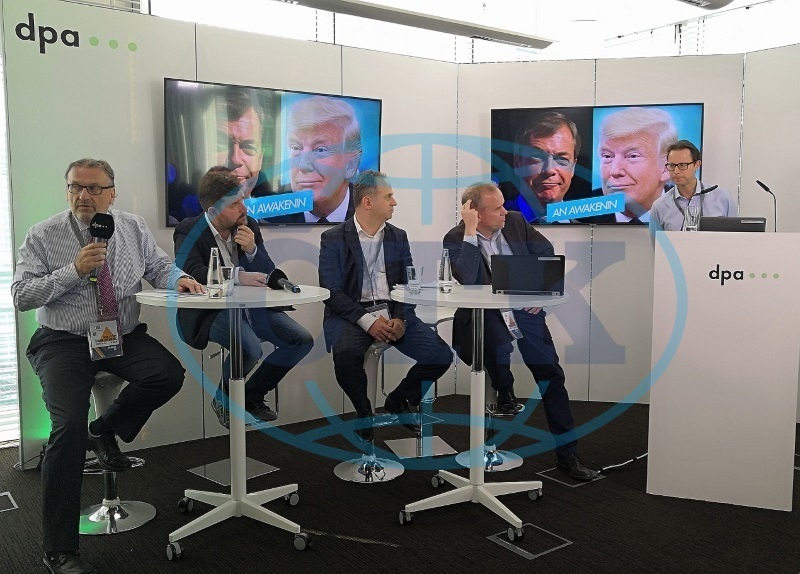 The EANA Spring Conference of 2019: "Opportunities for news agencies from fighting disinformation"
The EANA (European Alliance of News Agencies) Spring Conference of 2019 took place in Berlin, between April 3rd and 4th, with the title "Opportunities for news agencies from fighting disinformation". The Conference was launched by special guest Commissioner Gunther Oettinger, who spoke at the opening event about the importance that mass-media has for democratic societies. The Commissioner also stressed the added value that innovation has the potential of bringing to every media project, and underlined the need societies have for trustworthy news as the ones provided by news agencies. Peter Kropsch, CEO of dpa and President of EANA, started the conference day by discussing the future of EANA as seen by the EANA Board. "EANA is the the organisation for exchange about scenarios and strategies on the top level, aiming to guide our news agencies into a meaningful and prosperous future", Peter Kropsch said, stressing the need for understanding of the situative demands of the different types of news agencies. The President of EANA advocated for the "improvement of the visibility of EANA on the international parquet and especially in the European institutions to strengthen its weight in the international media community". Peter Kropsch also underlined the importance EANA has for its members, among others through providing support when a member in "under fire". Alexandru Giboi, EANA Secretary General, spoke about the study of national news agencies in Europe undertaken by the London School of Economics and Political Sciences, in partnership with EANA. "One common goal might be to publicly define news agencies as the most trusted source of information in the media environment. Seeing news agencies' General News Services as public goods can attract more customers by building trust in the product itself through societal and civic responsibility acceptance", said Alexandru Giboi. Also, EANA's SG pointed out to the keywords for the future evolution of news agencies, and of the media in general, as shown by the study: Trust, Innovation, Diversification, Communication. Christine Buhagiar (AFP Director for Europe) and Matthias Mahn (Senior Vicepresident of dpa) discussed the importance of the new Copyright Directive and showed how news agencies are mentioned within the text of the new legislation, but also presented ways in which news agencies can benefit from the new legal context in the future. Also, EANA's efforts towards the passing of the new Directive were presented. "(...) licenses are not transferable. Which basically means that publishers won't be able to resell to Google or Facebook this part of our work. (...) Our content is really worth money. ", said Christine Buhagiar. The EANA Conference keynote speaker was Margaritis Schinas, the Chief Spokesperson of the European Commission, who spoke about the European Union's own fight against disinformation. "It is our goal to secure free and fair European elections, through data protection, transparency, cybersecurity, cooperation, but also with appropriate sanctions guaranteeing that the rules are respected by all", the Chief Spokesperson said. Schinas also announced the introduction of a financial penalty for European parties/political foundations in case of infringement of GDPR rules trying to influence elections. Jenni Sargent, Managing Director of First Draft (https://firstdraftnews.org/), said that "the European elections present an urgent opportunity for newsrooms to work together and demonstrate united standards of verification, balance, and transparency, particularly when handling disinformation." According to Jenni Sargent, "all journalists should know how to identify and responsibly report the threats and coordinated tactics at play, without risking further amplification of a falsehood or conspiracy." But that particular mission is not easy, the Managing Director of First Draft agrees. "This is a complicated challenge, but we also know that working collaboratively can help. I welcomed the chance to speak today about what might be possible if we apply our CrossCheck collaborative methodology across borders, as part of an EU-wide project." Jenni Sargent concluded. Armela Krasniqi, CEO of ATA news agency in Albania, presented the impact fake news has on the country. Krasniqi showed that there was a "curious boom" of online publications in Albania: "over 700 news websites were registered in the last 5 years in Albania, 82 of them being portals without a known owner". The CEO of ATA also mentioned the 2018 Tirana Conference of Fake News, which ended with a joint statement from 13 European news agencies that agreed to strengthen their efforts in fighting disinformation. Fear, social unrest, hate speech and hate crimes, political uncertainties and the empowerment of radical movements, were mentioned by Armela Krasniqi as effects that disinformation campaigns have on societies. The second part of the EANA Conference in Berlin had its focus more on the business side of how news agencies tackle disinformation, with moderator Jiri Majstr, CEO of CTK and member of the EANA Board announcing the positive impact that fighting the phenomenon would have on news agencies. Phil Chetwynd, AFP Global News Director, mentioned accurate news as being at the core of the news agencies business, when discussing AFP's Fact Checking philosophy. "Misinformation is not going away. It is important all newsrooms create a real verification culture. ", Phil Chetwynd said. Stefan Voss, Verification Officer at dpa, showed the audience how dpa's verification team works for fact-checking news. "It is very important to decide how you use your resources of people and time because not all news are meant to be fact-checked", said Stefan Voss. Wojtek Surmacz, CEO of PAP, presented his opinion that the truth is now like a puzzle, and it can be very difficult to grasp by the public. "Today every internet user who wants to see the big picture about Europe has to spend a lot of time on reading a lot of different media outlets. But if we were to organize on platforms that allow the media access to all European agencies in one place, then the media - our clients, would have full access to unique information about Europe in that one place", said the CEO of PAP. Ural Yesil, International Operation Director at Anadolu Agency, held a presentation about PTS - AA's Photo Tracking System. "Our Photo Tracking System (PTS) is fully created by the staff of AA IT Department for fighting disinformation, blocking manipulations and dark propagandas," he said, adding that the advanced system enables AA to track its own visual content by detecting where, when and how they are used by the third parties. Jan Bayer, President of News Media International at Axel Springer, was the special guest to close the EANA Conference in Berlin. During his speech, he mentioned that the success of media can not be measured only in sales and clicks. "The media should be serving a higher goal, and that is delivering reliable information", said Bayer.